I wish I WOKE UP LIKE THIS everyday - lol! I'm so excited to share with y'all something that I've been wanting to try for so long! I don't talk much about hair since I don't really do much besides using my awesome BEACHWAVER by Sarah Potempa (check out my review on that here). Irresistable Me is a growing brand of 100% natural Remy clip-in hair extensions, hair accessories and hair tools. Irresistible Me specializes in high quality extensions at great prices. They are based in the Fashion District in New York. I am quite the novice when it comes to hair, so when it comes to hair extensions, I want something that is going to be easy and effortless! Irresistable Me offers two types of hair - Silky Touch and Royal Remy. 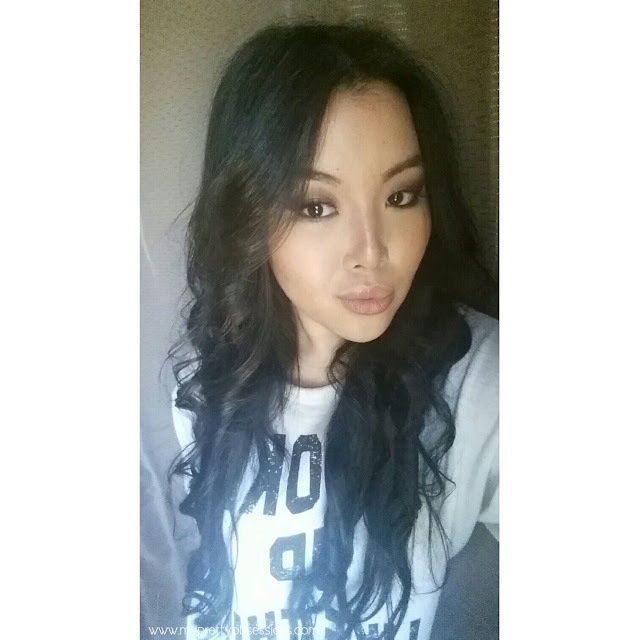 Silky Touch is 100% human Remy hair. The thickness of the hair decreases very slightly towards the ends just like normal hair does which will provide a completely natural look while wearing them. Silky Touch offers 11 different shades to choose from that best suits your hair. Royal Remy is their premium line made with 100% human Remy hair. A special treatment unique to Irresistible Me is added for extra silkiness and durability.The thickness of the hair is the same from top to bottom of the weft which will provide a lot of body and bounce while wearing the extensions. Royal Remy offers 12 different shades to choose from. Remy Hair is considered to be the finest quality of human hair because it’s the hair collected from the donor's head and preserved to ensure all the cuticles are healthy, living, and facing in the natural growing direction. I didn't even need to use all of the wefts, I only used 4 wefts for my big head lol! The choice depends on how fine your hair is and what volume you are looking to add. 100g - If your hair is fine and are looking extra length and volume. 200g - If your hair is already thick or if you're looking for maximum volume and amount of hair. 140g - It's a great way to compromise between both weights above. Personally for me, my hair is super super fine so the thicker the hair, the better! I LOVE LOVE volume - dramatic much, why yes I am lol! I received the 200g extensions. To determine your desire length, use a measuring tape and measure your own hair from 1" above your ear and see how much longer you want to go from there. My hair measures approximately 18" long and I chose 22" in length for my extensions (when I curl the extensions, it will be a bit shorter). You pretty much take care of your hair extensions as you would with your own hair on your scalp. Irresistable Me hair extensions can be washed every 10-20 wears or when you feel that it has too much product build up in it or become unmanageable to style. You can style your extensions with hot tools (keep in mind, it's just like your own hair and can be drying to the extensions if you do it too much, I suggest using a heat protectant before you style with a hot tool). I learned from Jacklyn Hill on YouTube that it is best to hang up your extensions with a hanger to keep your extensions from knotting up, collecting dirt, etc. I like my hair extensions from Irresistable Me! The set I received and have been wearing for the past month is their Silky Touch in Natural Black (which is black with a brown undertone), 22" and 200g. 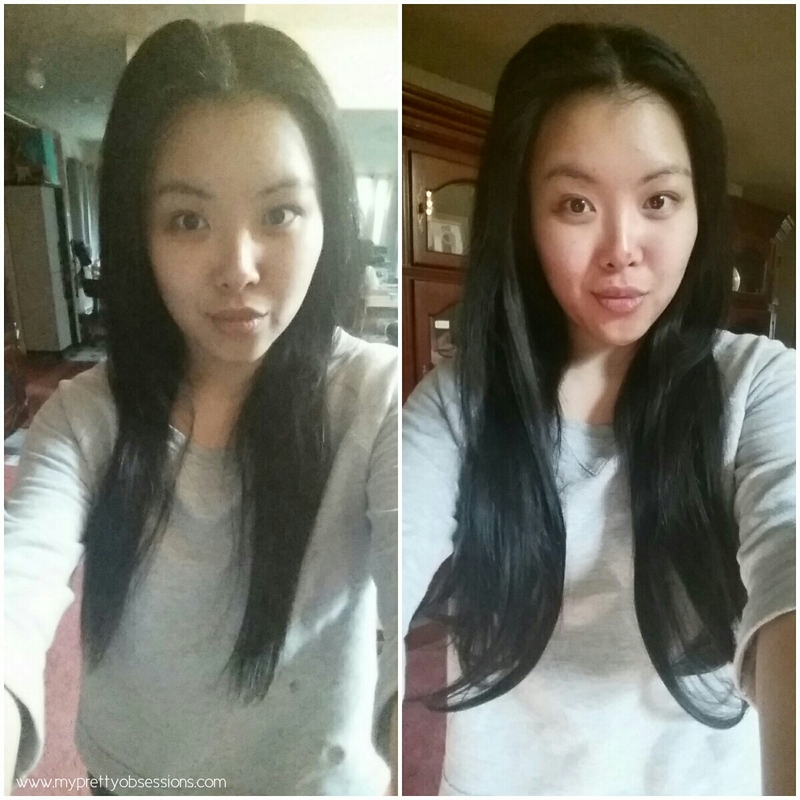 You can definitely see how much of a difference hair extensions make! If you're new (like me) to wearing hair extensions, it will take a bit of time to get used to wearing them. I started getting more comfortable with wearing mine around the second to third time. Although it took me some time to figure out which weft was best to wear, the hair extensions are easy to put in (I can provide a step by step on how I put in hair extensions if you're interested!) and the finished look is satisfying. I am so pleased with Irresistable Me that I'm sure to order a few more sets in the near future. What are your thoughts? Or recommendations? I've never worn extensions and I'm happy to see that you explained the weights, I never understood that. You can definitely see a difference, love it! I love how the extensions look on you! That's something I've never tried, but I've always been curious about. Thank you, I really appreciate it! If you do try extensions, please let me know Lauren! I think it's quite fun to wear and great because these gave me the extra 'oomph' I've been wanting! I've always wanted to try hair extensions but hubby gave me a weird look lol! You look gorgeous love, you look like an anime so cute! I have read you can also bring your extensions to your hair dresser so they can cut and style it for you. It's definitely fun to have them, short hair one day, full on long, think hair the next hehehe! I completely understand about your hubby because mine gave me the weird look when I told him I wanted to try it and luckily when I did get this from Irresistible Me, it wasn't weird like he thought it would be. My father-in-law was the one who thought it was so weird lol! (MIL loves it btw haha!) Thank you so much my love, you're the best! That's very true and another good thing about hair extensions is yes you can definitely do all of that as well! Thank you for bringing that up love! If you ever get a set of extensions to wear, let me know! I can't wait to hear your thoughts on them! Love the hair extensions!! 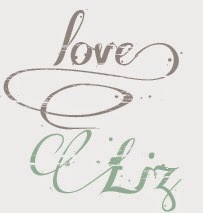 They look so natural on you Liz! !